Let us help you transform your home, your entire home, into the modern space you've always dreamed about! At Modern Digs, we believe that a beautiful modern home should naturally incorporate stunning outdoor spaces that are more than just attractive. You should love to use them! Whether it's a nook in the garden, or a stunning atrium off of your main living room, our collection of affordable modern patio furniture will transform your spaces into retreats. Shop our collection of outdoor dining tables to find a unique array of designs and materials. Whether you're looking for something subdued or stunning - from concrete and steel to wood and wicker - we carry an array of shapes, sizes, and styles you're sure to love! Large and small. We even boast an amazing modern outdoor ping pong table you're sure to envy. From there, you can complete your outdoor patio set with some of our bold outdoor dining chairs. 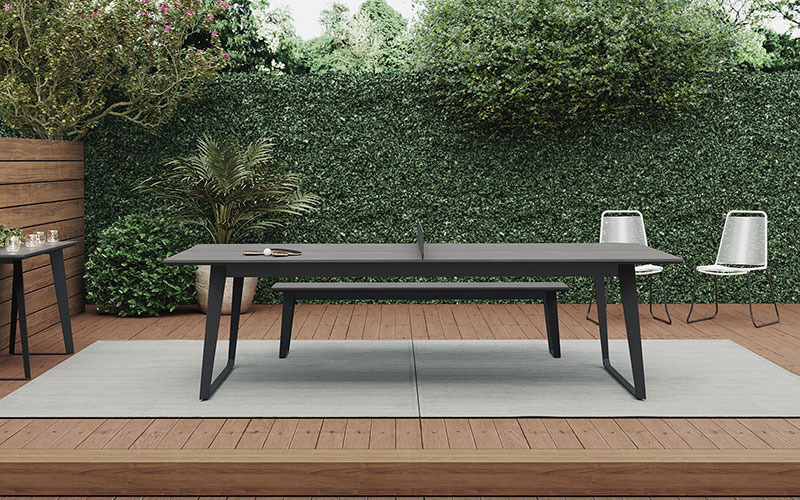 Every design is hand-picked, so not only do you get a myriad of materials and colors, they're all affordable contemporary designs that will pair perfectly with your mod outdoor dining table. And don't worry if you're more of a lounger than a diner! Our assortment of modern lounge chairs, chaises, sofas, and sectionals will have you lounging under the sun in style. Just find your favorite daybed, pair it with an outdoor accent table or two (or maybe a coffee table), and finish your deck in a contemporary style you and your family will love. Finally, finish the whole space out with some of our outdoor accents. A bright rug will soften your patio, while a few accent pillows can add bright and fun pops of colors into your space. As always, we're here to help with any questions, so don't hesitate to email or call with any questions! Check out our favorite outdoor table - the Amsterdam outdoor ping pong table!